CPA firms obviously need skilled workers with specialized knowledge to complete accurate and professional work for countless clients. Because the work can be so specialized, recruiters at these firms are looking for CVs or resumes that possess consistent work timelines that display experience and qualifications. But your resume is different. It contains holes or gaps in the timeline. And nobody wants to present to employers the Swiss-cheese equivalent of a resume. First, let’s talk about education – a key component of a CPA’s resume. Firms will look at accountants based on their work experience but also the expertise that comes from their schooling. Accounting is ever changing, and rules and regulations change too. Keeping up to date on issues such as financial report standards, GAAP and cash-basis accounting, will help in your search and make the holes a bit smaller when recruiters are looking at your career. The truth is CPA firms are looking for consistent growth and promotion in your career trajectory. It may not always be a straight upward line but as long as it is moving in the right direction, the holes in your career (and on your resume) can be explained, and thus not present any real problems. For example, many firms are looking at your general success. Have you achieved promotions? Can you meet expectations? Can you do a job whether or not you have a gap in your employment history or not? CPA firms also want to know about your staying power. Job jumping on your resume may send some red flags to your prospective employer, and they would like to know that the time and money they spend training you will result in some long-term commitments. Unfortunately, when compiling resumes, too many people think more is more, when in fact the opposite is true – less is definitely more. The tighter or more condensed the resume, the better. One page is generally all it takes. And this has the added bonus of accomplishing two things at once. First, recruiters will more likely read what is in front of them before moving on to the next candidate. 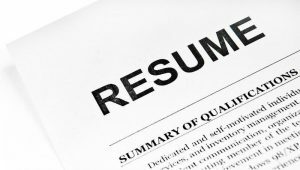 Concise, well-written (and typo-free) resumes get more attention and thus have a more likely outcome of getting you an interview. Second, the more concise the resume, the easier it is to fill in some of those holes that may have occurred when you first graduated or early on in your career. You don’t always have to go back to your very first job to explain your career path. Some of that can be explained in person or in a cover letter. And speaking of cover letters, a good concise cover letter can also help fill in any gaps that need explanation. It is not necessarily a good idea to volunteer too much information but some of the history left out on the resume can be discussed, along with experience, in the letter to recruiters. This is sometimes the first and only thing they read to get you to the next level. Make sure your cover letter provides new information and is not just a summary of your CV. Remember that many people have similar career “issues” within their CVs that look like holes in the timeline. CPA firms know that and will not be too bothered by it so long as you can explain your career, your path and your experience as it pertains to the firm you are applying to work with. Good luck!